I recently acquired this watch, the Hamilton so-called 'canteen' as it should have a screw down cap over the crown, sadly mine is absent although I hope to find one soon...despite the missing cap it has a great wabi to it! The damage to the tempered glass crystal is quite common amongst watches that have seen action, often even with large chips or even cracks due to impact with coral and other underwater hazards! Made for the US Navy's Bureau of Ships by Hamilton (and later Elgin to a slightly different spec) they were used by amongst others, the first Underwater Demolition Teams (UDT) who have a long history of clearing harbours and beaches during most theatres of combat from WWII onwards. The watches are unusual in that in an attempt to try to seal them from the ocean the crystal was fitted with a thin metal rim around the base which was soldered to the case and the previously mentioned 'canteen' crown cap was added. Howver, despite all this, it seems the water-resistance wasn't all that. 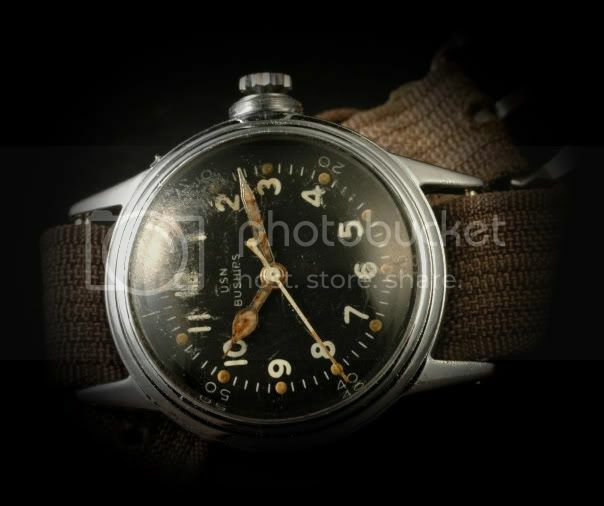 I think I saw that one for sell over at MWR forum.I hope you find that cap for the crown I think they made less Hamiltons than the Elgins so parts are hard to come by for both models of canteen watches.I would go to NAWCC marts and shows and look for guys selling parts were they have boxes of stuff mixed together the sellers that buy out watch repair shops and they don't know what they have and you mite get lucky and find the cap mixed in the box.Found a few of those wenches for removing the back covers for WW2 era issue watches that way.